With more experience, higher assets under management and a focus on serving clients first, IMCA members provide invaluable counsel to today’s retail and institutional investors. IMCA members average $201.8 million in assets under management (AUM)—nearly four times the overall industry average of $52.8 million per advisor. 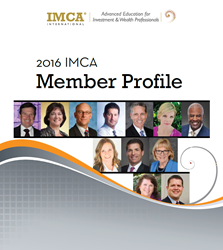 More than half (53 percent) of IMCA members have more than 20 years of industry experience and 22 percent have 15-19 years of experience. 38 percent of IMCA members serve clients with a net worth of $2 million or more, compared to only 21 percent of other advisors. 84 percent of IMCA members describe themselves as earning fee-based compensation. ETFs, alternatives, separate accounts usage on the rise. 45 percent of IMCA members expect to increase usage of ETFs, 34 percent expect to increase use of separate accounts, and 27 percent anticipate using more alternative investment products (excluding alternative and commodity mutual funds), according to the 2016 profile. Click here for the 2016 member profile. Contact: Ryan Hoffman, Communications Director. P: 303.850.3079 E-mail: rhoffman(at)imca(dot)org. Twitter:@IMCA. Established in 1985, Investment Management Consultants Association® (IMCA®) is a nonprofit professional association and credentialing organization with more than 10,700 individual members and certificants worldwide. IMCA’s mission is to deliver premier investment and wealth management credentials and world-class education. Since 1988, IMCA has offered the Certified Investment Management Analyst® (CIMA®) certification, which is accredited by the American National Standards Institute (ANSI), to meet international standards (ISO 17024) for personnel certification. IMCA’s Certified Private Wealth Advisor® (CPWA®) certification is suited for wealth management professionals working with high-net-worth clients. In 2015, IMCA conferences, online education and regional seminars hosted more than 4,500 attendees.